Spring is here, which means babies are in the air! In order to have baby bird we must incubate and brood. You might ask, what the heck are those? In order for fertilized eggs to hatch in to chicks in the Spring they must be incubated. Traditionally a mommy bird (chicken, duck, goose, etc) will sit on her eggs to keep them warm for about a month, and then they hatch! When we incubate eggs we have to mimic what a live animal would do. That means keeping the eggs warm, with the right humidity, and turning them twice a day for about a month. 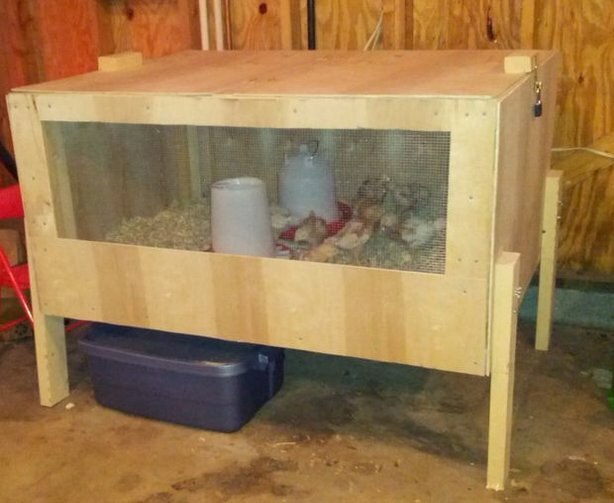 Here is an example of a brooder. Once chicks start to hatch we are on to brooding. Chicks have to be kept at about 90 degrees for the first couple days, and then very slowly kept less and less warm. Now a momma bird doesn't really "brood" in the same way we do. She is more like a walking warmer for the chicks.The momma hen does this by allowing the babies to come and snuggle under her to rewarm. We do this with heat lamps, etc. Brooding usually lasts about 4 weeks, or until the chicks start to develop feathers that protect them from the cold. Like all new life it is amazing to know the process including all that can go wrong, and what it takes to be successful. We should have our own chicks any day now. Ducklings from our own incubator, and chicks from a momma hen who is sitting. We will see! !